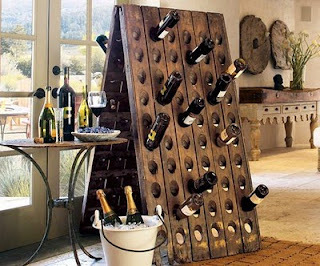 This French oak champagne riddling rack was featured in the most recent issue of Belle magazine, picked by an interior designer who took inspiration from the iconic and ultra stylish Belgium designer, Axel Vervoordt. 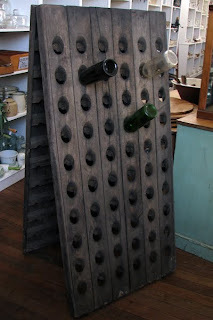 Riddling racks, or pupitres, were originally used in the hand riddling process of making the champagne. Most wineries now use mechanized riddling equipment,however some still use the traditional approach...I know which method would look better! They are making their way into homes, where people are using them for wine storage. Also, check out the French butcher's block in the background of the above photo. We plan to give the riddling rack above a wax using our natural beeswax polish to enhance the oak timber, which is 19th century. And I adore this photo, from Belle magazine June/July 2009 issue (page 95). The dress on the antique French mannequin is exquisite. I love the detail of the shoot from the globe to the Louis Vuitton trunks, and the hat box on top of the armoire. I think the armoire would look better if it had mirrored doors to reflect that beautiful dress. Just like the one below! 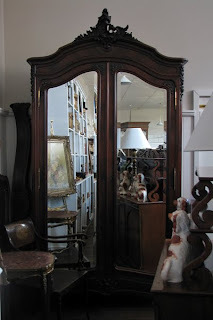 It is a French rosewood armoire. This photo shoot is also from Belle June/July 2009 (page 96) I like the terracotta pots strewn across the floor, and the old wheelbarrow, flowers, tin buckets etc. The terracotta pots are available in Sydney. I am not sure whether they would have any left after this photo went into publication! They would have been highly sort after. These pots are French and are actually hand-thrown, a method they do not use anymore. Some people have bought them to cook little breads in. I will have to trial that one myself and report back.